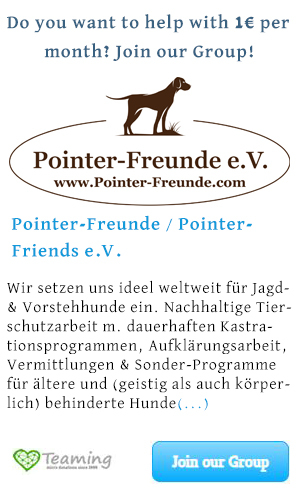 Type and Nature - Pointer-Freunde e.V. 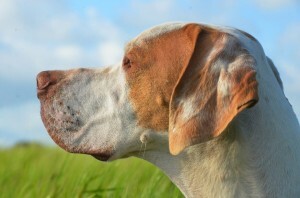 The character of a pointer is highly sensitive and very temperamental. It is a wonderful companion that always faithfully stands by ones side. Pointers are very social and gentle dogs. They usually get along with other dogs very well and react highly diplomatic. They normally avoid trouble in a skillful way. In spite of their sensitivity, they are tough and durable. The pointer is kind to children, affectionate, adaptable and adorable; thus an ideal house companion. It is suitable even for large flats, but needs enough exercise. There is hardly a breed of dog that is more sensitive, more delicate and gentler than a pointer. In addition, it is cooperative and smart and is very attached to its owner. The pointer requires a sensitive upbringing. Hardness in upbringing is absolutely not appropriate for a pointer. 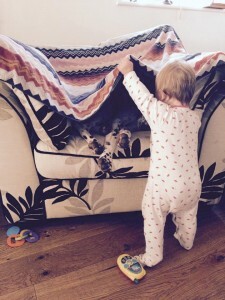 Due to their sensitivity, pointers are usually very careful with children. In particular, sporty and agile pointers need to spend their excess energy, such as man trailing, agility training, jogging, and running next to a bicycle or horse. Sleeping, lying in the sun and a lot of cuddling is also a part of the daily program. Experts say pointers are like wine the older, the better. A pointer enters into a very close relationship with its family. Who is ready to spend time with this wonderful dog and form a relationship, will certainly have much joy with his four-legged friend – and it with him! The aristocratic-looking English Pointer is friendly, amiable and gentle, but very temperamental, fast and durable. At first glance, its refined nature belies its excellent skills as a pointing dog. It provides hunters good services, by tracking down any prey with its fine sense of smell. In contrast to many other hunting companions, it indicates this by a motionless poise. Only, when it receives the appropriate command, it scares the game. 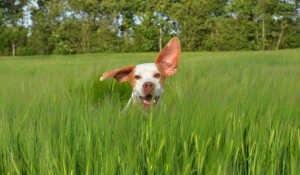 The original purpose of the gentle, obedient and serious pointer was selected from its natural behavior. Every dog “poises” for a short period, when it has the scent of prey in the nose before jumping forward to catch it. With the pointer, this poising was extended through targeted selection to a permanent standing (pointing). The nose of the pointer is very sensitive and so he can perceive in full running the scent of partridges or pheasants from 50 m away. The selective breeding has produced an incredibly elegant and friendly animal that however is very sensitive. Tips: Easy to take care of. Pointers are very clean; the short coat requires little grooming. Exercise is important to the pointer; at the same time on long evenings, it also happily remains in front of the fireplace or on the sofa with its family. Conclusion: Pointers are both hunting dogs and family dogs. The breed German shorthaired pointer is very popular with many people, as it is extremely adaptable. These dogs can adapt very well to a family that includes children, and behave – depending on the education – also friendly and amiably to strangers. This breed is also an excellent choice for singles or young couples who are particularly active in sports. These dogs belong to the so-called pointing dogs and therefore need regular and very extensive walks. Therefore, it has a strong hunting instinct, a huge urge to move and is very willing to work. The German shorthaired pointer has an excellent sense of smell and a good orientation. By nature, it is intelligent, courageous and loyal. In addition, it also likes to face tasks, which must be mastered. Therefore, it is essential that its owners are frequently and extensively in the open air and the animal is demanded to exercise, because a German shorthaired has a lot of energy. Despite his affectionate and tender mind, a German shorthaired can be used as a hunting dog if he is trained accordingly. The German shorthaired needs an experienced dog owner and a consequent upbringing. A hunter finds in the German shorthaired a reliable, enduring and loyal partner. The German shorthaired is full of temperament, independent and intelligent. It is good natured and reliable, but not nervous, shy or aggressive.